A month after sending out his press release, Pauling was at a loss. Despite the newspaper coverage, he wrote a contact in a pharmaceutical company, "Not many people have written in for information about our experiments on the in vitro production of antibodies. Perhaps they have been too skeptical." Indeed. The scientific community was still waiting for the data. Most immunologists withheld comment until Pauling finally published his results in Science and the Journal of Experimental Medicine in August 1942, five months after the press release went out. The papers were not impressive. Pauling's control experiments looked weak. The experiments were described with such a paucity of detail that replicating the work was difficult. When Landsteiner and others tried to create artificial antibodies using Pauling's approach, they failed. Nor were things going well inside Pauling's lab. Dan Campbell seemed to be the only researcher who could make artificial antibodies. When others, students and postdoctoral fellows, tried, they had no luck. "You have my good wishes in your endeavor to create artificial antibodies," one research fellow wrote Pauling, "but I must confess to a feeling of pessimism.... Frankly, I am not impressed by experimental procedures which work sometimes but which do not at other times, and no cause can be assigned for the failure." Further experiments in which Campbell's artificial antibodies were given to infected test animals showed only a slight effect. By early 1943, even the Rockefeller Foundation was becoming skeptical. 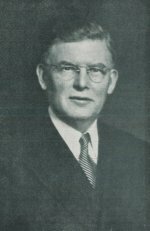 Pauling was now dealing with Frank Blair Hanson, who had taken some of Weaver's duties during the War, and who was less entranced than Weaver with Pauling's work. Hanson surveyed the nation's leading immunologists to see what they thought about Pauling's claims. The responses were not encouraging. The general consensus seemed to be that Pauling's experimental evidence was thin at best. The results were not convincing. Even Landsteiner opined that the chances were less than 50-50 that Pauling had created artificial antibodies. When Hanson asked why, in the face of so much inconclusive work, his artificial antibody grant should be renewed, Pauling was uncharacteristically retiring, saying only that he was "disappointed" with his failure to find medical applications for his antibodies. The Rockefeller Foundation responded by cutting his funding for the project by more than half. The experimental results continued to look weak. Pauling began downplaying the importance of the work. He stopped talking about artificial antibodies. He quietly abandoned his patent application. And the whole issue faded away as immunologists began to put together a picture of a far more complex – and much different – method of antibody formation in the body. Pauling, it was clear by the end of the 1950s, had been wrong. But he never retracted his work. He continued to believe that Dan Campbell had created artificial antibodies, albeit "very weak ones." Campbell, for his part, told another Caltech researcher years later that the whole thing had been the result of overenthusiasm. A lab assistant, he said, had shaded the results to fit what he thought his bosses wanted to see. The whole thing, he said, happened "because of some technician who wanted the results to please the professor." See Also: Letter from Linus Pauling to Robert D. Coghill. June 26, 1942. See Also: Letter from Linus Pauling to R. Kuhn. July 31, 1942. See Also: Letter from Frank Blair Hanson to Linus Pauling. May 7, 1943. See Also: Letter from J. P. Youtz to Linus Pauling. May 19, 1943. See Also: Letter from Frank Blair Hanson to Linus Pauling. May 24, 1943. See Also: Letter from Linus Pauling to Frank Blair Hanson. May 28, 1943. 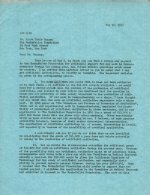 Letter from Linus Pauling to Frank Blair Hanson. May 17, 1943.